The Chevrolet Kingswood Estate Wagon was a station wagon that was originally introduced by Chevrolet in 1969 as the top-of-the-line Chevrolet station wagon. 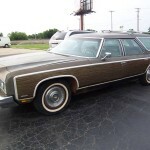 The Kingswood Estate was the station wagon version of Chevrolet’s popular Caprice. When the Caprice, along with other GM B-Body models, were replaced with a new platform in 1971, the Kingwood in with the all the new models. 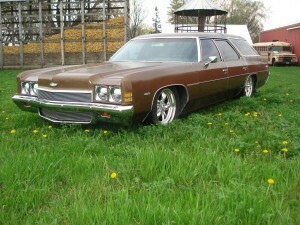 The Kingswood would be renamed the Caprice Estate Wagon in 1973, as Chevrolet consolidated all premium Chevrolets under the Caprice name. The Kingswood Estate was all new in 1971 and featured the new fuselage styling of the Chevrolet Caprice and Impala. 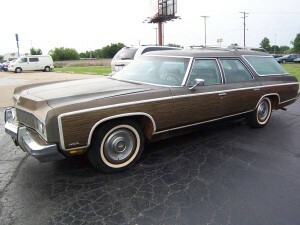 To distinguish itself from the regular Kingswood wagon and other B-body Chevrolet wagons, the Kingswood Estate added faux-wood paneling on the sides and tailgate, and had a slightly fancier interior. 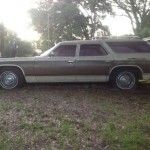 The Kingswood Estate now used a 125-inch wheelbase and had a new rear suspension that used a solid axle with leaf springs as opposed to coil springs and trailing, that was used on the Caprice sedans and coupes. Also new on all GM B-body wagons was a “Glide-Away” clam shell style disappearing tailgate. The tailgate had the upper glass portion of the tailgate slide into the roof, and the lower steel portion slide into a compartment under the floor, providing a completely open space with no tailgate in sight. The Kingswood came in two-seat or three-seat configurations. The three-seat model had a forward-facing rear seat that was placed over the rear axle area allowing for two additional passengers, making them eight-passenger wagons. Cargo capacity for the new wagon wagon was an impressive 106.4 cubic feet, with 100.5 inches from the back of the front seat to the tailgate. Such space allowed the wagon to hold a 4 ft × 8 foot sheet of plywood with the tailgate closed. The Kingswood Estate came with a 400 cubic inch two-barrel engine as standard equipment. Optional engines included a 300 horsepower 400 cubic-inch Turbo Jet V8 and a 365 horsepower 454 Turbo Jet V8. All station wagon models came with single exhaust systems. 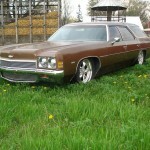 While the Kingswood Estate Wagon and the Caprice were strong sellers for Chevrolet, all top-of the line Chevrolets would be named Caprice in beginning in 1973. Therefore, the Kingswood Estate Wagon was renamed the Caprice Estate Wagon. This naming configuration would continue from 1973 until 1976. 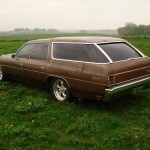 During that time the Caprice Estate Wagon would continue with minor mechanical and trim changes similar to the Caprice Classic until a new wagon arrived in 1977. For 1977, a new GM B-body appeared across all GM divisions. 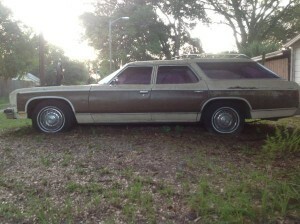 As such the Caprice Estate wagon would be downsized along with the Chevrolet Caprice and Impala. See the 1977-1979 Chevrolet Impala for information on the new B-body platform. Or, for other classic Chevrolets, see 1965-1970 Chevrolet Impala. To find your own Classic Car or to sell your Classic Car, see Classics for Sale. This entry was posted in Chevrolet, Kingswood and tagged B Body, Caprice, Estate Wagon, Impala, Safari Wagon. Bookmark the permalink.